Markets ended another volatile week on an upbeat note after a wave of economic data showed that the economy is still on the right track. For the week, the S&P 500 gained 0.95%, the Dow grew 0.93%, and the Nasdaq gained 1.19%. One of the biggest headlines last week was the April jobs report, which showed that 288,000 new jobs were added in April, many more than economists had predicted. Even better, employment gains were widespread and represented growth in multiple sectors across the economy. The monthly jobs report garners a lot of attention. We wanted to use this week's update to dig deeper into some of the data behind employment reports to show you why jobs numbers are watched so closely. Why Do Labor Market Reports Matter? Employment reports matter to the overall economic picture because jobs growth is an important stimulus for economic growth. Job growth is highly correlated with improvements in consumer confidence, which often presage increases in spending. Since spending accounts for over two-thirds of economic activity, you can understand why analysts monitor the labor market closely. Is The Labor Market Actually Improving? If you've been keeping tabs on the many labor market-related headlines, you've probably heard pundits say that the labor market is showing signs of overall improvement. What does that mean, exactly? Let's look at some data. One of the most important short-term indicators of labor market health is the weekly initial claims for unemployment, which captures new applications for unemployment benefits. You can see in the chart below that the 4-week moving average of initial claims (a much less volatile measure than weekly claims) has been steadily declining since the recession peak in 2009. While the data is volatile and 'noisy,' the long-term trend shows significant improvement. Another important indicator is the number of voluntary separations, which tracks workers' willingness and ability to leave their jobs. Generally, this happens when folks find a better job, so it's a good signal of improvements in the quality and quantity of jobs available. This chart shows that the number of monthly quits has been on a general upward trend since early 2009. However, the picture isn't completely rosy. Much of the fall in the employment numbers released last week can be attributed to the more than 800,000 Americans who dropped out of the labor force in April. Realistically, declining labor force participation is probably going to stay with us as baby boomers continue to retire and young people wait longer to find employment. However, most of the recent decrease comes from discouraged workers who are dropping job searches out of frustration. This is troubling. The Bureau of Labor Statistics (BLS) defines discouraged workers as those who want a job but are not currently looking because they don't believe jobs are available or that they qualify for current opportunities. You can see that the measure of discouraged workers is extremely volatile, but the overall trend since 2011 is downward, which is where we want it to be. However, we've still got a long way to go before workers and their skills will match available jobs. What Does the Unemployment Rate Actually Show? You've probably heard a lot about the unemployment rate. However, did you know that the government calculates six different measures of unemployment? The so-called headline rate is officially known as the U-3 measure and calculates total unemployed as a percent of the total civilian labor force. For a broader measure, we can look at the U-6 rate, which also captures under-employment. This calculation includes people who, while they don't meet BLS definitions of unemployed, still suffer the effects of a weak job market. 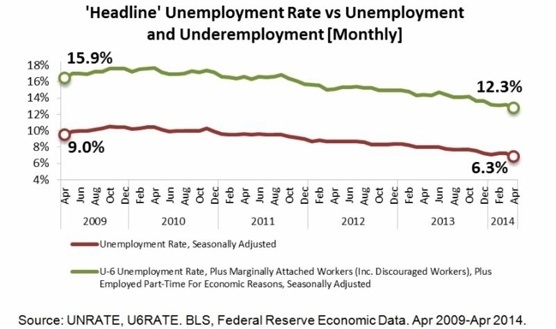 The top line shows this broader measure of unemployment. Right now, while the headline unemployment rate is 6.3%, we can tack on another 6.0%-worth of discouraged, under-employed, and forced part-time workers. Digging a bit deeper, involuntary part-time work is the largest contributor to the difference between headline unemployment and the U-6 measure, indicating that, while many Americans have jobs, they aren't able to work as much as they might like. Overall, medium- and long-term trends in employment data show that the labor market is largely getting better. However, in the short-term, seasonal effects, unique business events, and other factors can make the jobs picture much less clear. This is why policy makers like the Federal Reserve look at a variety of indicators (including the data we've examined in this update) to develop a more nuanced view of what is happening in the economy. As financial representatives, it's our job to monitor many different indicators, including the data we've shared with you in this update, to understand the current economic picture and develop strategies for our clients. I hope you've enjoyed our foray into some of the numbers behind the employment headlines. We enjoy providing educational and informative content, and we welcome any comments or questions you may have. First quarter GDP estimate shows weak performance. Investors got their first look at Q1 Gross Domestic Product (GDP) growth and the current estimate shows that the U.S. economy grew a sluggish 0.1%, mostly because of the lingering effects of winter. Keep in mind that economic estimates change frequently, and revised data may show a more upbeat picture. Federal Reserve continues taper. The Federal Open Market Committee (FOMC) met last week and voted to continue tapering, decreasing monthly bond purchases to $45 billion. The move wasn't a surprise to analysts, but it serves to underscore the Fed's faith in the economic recovery. Consumer spending soars in March. Warmer weather encouraged American shoppers to return to malls and car dealerships, boosting consumer spending by the highest amount in nearly five years. Ukrainian crisis turns violent. Ukrainian military forces engaged pro-Russian insurgents in eastern Ukraine, attempting to regain control over the economically important east. Russia continued to mass troops on the border and warns they will respond to attacks on Russian interests. N.B. The time period in this chart is different because the BLS changed its calculation method for discouraged workers in January 2011, rendering comparisons before and after the change problematic.